Ian Ellis was birdwatching in Linconshire, UK from a nearby bird sanctuary when he noticed that the cows in the field were behaving strangely, the Daily Mail reports. Rather than grazing, they had gathered around something in the mud and gently nudging it. Ellis instantly knew that these intelligent and gentle animals were onto something. The 67-year-old used a telescope to investigate. To his surprise, he saw that the cows had gathered around a small seal pup. Although cows may not sound as exotic and fascinating as other animals, the truth is that they're much more complex and intelligent creatures than most people are aware of. Think Differently About Sheep highlights their incredible sense of smell, intelligence and extreme curiosity, they'll "investigate anything and everything." 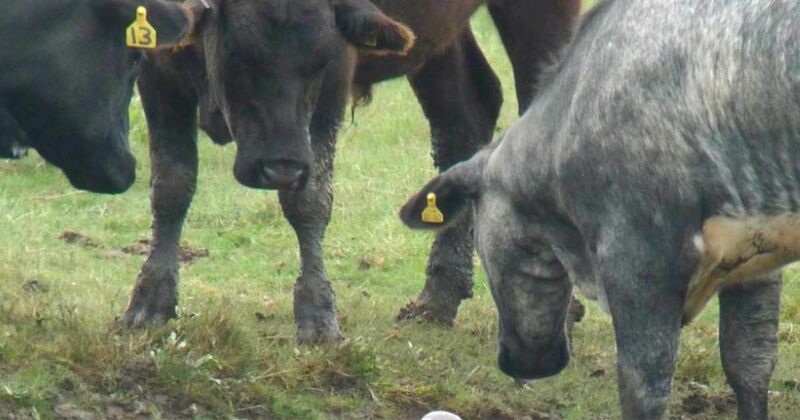 However, it wasn't only these cows' curiosity what saved this stranded baby seal. Think Differently About Sheep also emphasizes cow's loving and friendly nature, and how "they love to babysit for one another." Cows are excellent mothers, and it's probably safe to assume that they perceived the seal as a baby in distress. Thanks to the cows' curiosity and caring nature, Ellis was able to find and help rescue the baby seal. Along with a staff member at the bird sanctuary, they went to free the pup from the mud and contacted Natureland Seal Sanctuary. The field is connected to a marsh, and experts believe the pup somehow got separated from its mother. When the tide went out, she was trapped in the mud. Mr. Ellis who found and helped to rescue the seal pup. The seal pup was only 5 days old and showed signs of weight loss and dehydration. The first stage of treatment was to rehydrate her, and begin by giving her high-fat herring to regain her weight. Though she did not initially look like she would survive, she is doing well, and has since been named Celebration. Celebration in her pen at Skegness Natureland seal hospital. Celebration will continue to be monitored carefully at the Seal Sanctuary until she is big enough and healthy enough to be released into the wild. This lucky baby has a lot to be thankful for, especially having been found by such intelligent and caring animals as cows are.